Digital front ends (DFEs) process and automate production workflow while providing the maximum image quality. This week we discuss DFEs in modern production environments. For more Web-exclusive content, the latest news, and more, visit dpsmagazine.com. Follow us on Twitter and visit our website for the latest industry news. Also, check out our March digital edition. Visit dpsmagdirect.com - our information portal - for more on the products and solutions described below. Editorial Mission: To provide a resource of thought provoking content, spotlighting present applications and success stories in digital-content publishing for business leaders. Our editorial exclusively targets decision-makers charged with harnessing the document. Through dynamic implementation of enterprise communication initiatives, DPS readers can maximize their company's profitability. 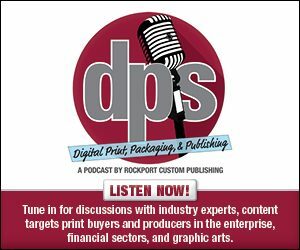 DPS is the most efficient media resource available, cutting across vertical market boundaries in topic areas including: Customer Retention Management (CRM), Scanning, Digital Printing, One-to-One Marketing, Content & Asset Management, Electronic Bill Presentment & Payment (EBPP), Web Publishing E-commerce and outsourcing. Copyright 2017 Digital Publishing Solutions. All rights reserved.